Cassandra is a very sweet little girl! 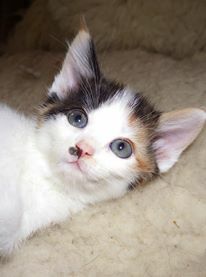 She is one of ten kittens that were abandoned in the middle of a road, in the woods, with no hope of survival. Luckily, the good people outnumber the bad, and she and her 9 siblings were all taken in. She is now in a safe and loving foster home. She loves playing with other cats, and is a snuggle-bug to boot!